Some years ago we wrote about whether or not it is “permissible” to cut stones for suiseki (see To Cut or Not to Cut). As we talked about in the first article, there is a lot of debate within the suiseki world on this subject. In Japan there are a large number of suiseki enthusiasts and clubs. Some of the groups concentrate only on natural stones, while others do accept cut stones. San Francisco Suiseki Kai teaches that a natural stone is always preferred. However, the club’s teachers, from the founding of the club in 1982, have allowed stone cutting when, and only when, it improves the presentation. Mas himself loves the natural stones, but he also appreciates the great cut-stone suiseki. He brought several stones to the club meeting this November to illustrate the decision making process. Take your time. Once you’ve cut the stone you can’t change your mind! And even if you are sure, there is always the chance that the stone will break during the cutting. Cutting a stone should always be the last option. 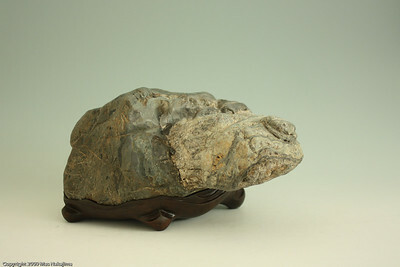 A natural stone may not meet all the “rules” of suiseki, that is part of their beauty. Like a human, each stone is an individual, with good points and bad. A cut stone, however, should meet the basic rules of suiseki. It should follow the so-called Rule of Three Dimensions (三面の方 San Men No Hō) and have good balance and proportions in all three directions. It should have a good seat or posture (構え Kamae), with the ends and peak leaning slightly towards the viewer. Daiza for natural stones are difficult to make well. For beginners, start with your cut stones and keep your natural stones until you have developed your skills. A gallery of photos that walks through the lecture is here: When to Cut – Gallery. To my long-time readers – my apologies for such a very long absence. Life intervened, and I haven’t been able to write anything for so long – but I hope now that I can now return to posting articles about Mas’ suiseki, and our life and travels! Whenever Mas and I visit Japan, our home base is my brother-in-law’s house in Nagoya. Keizo and his son Ikuhito live in a small, comfortable, “mansion” (what Americans would call a condo). Every day, Keizo shops for the best fresh fish and vegetables and cooks delicious, nutritious meals. 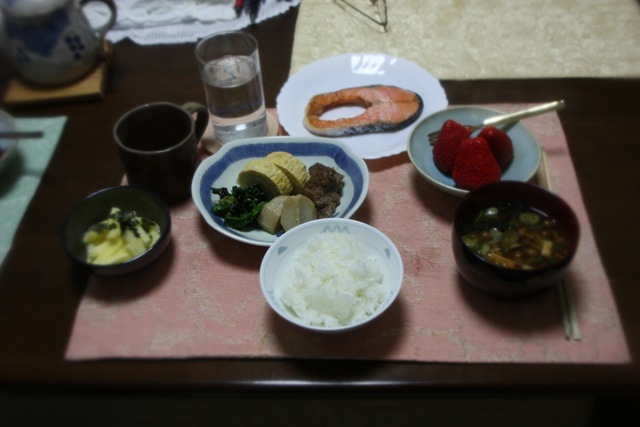 This breakfast from yesterday is typical: a rich red miso soup with mushrooms and tofu, some sweet, delicious local strawberries, grilled salmon, a small disch with spinach with miso, taro, grilled chicken liver, and Japanese style omelet, some “naga imo” (a kind of yam) with egg, and a bowl of excellent, perfectly cooked rice. 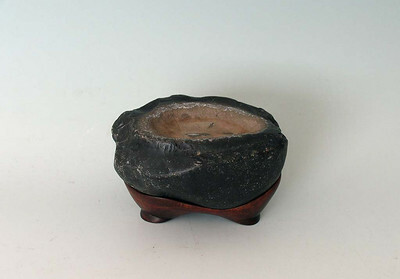 Keizo is also a potter, and made the dish holding the strawberries and the teacup. Yesterday Mas and Keizo and I drove to Dachi, their home town, to visit their mother and older brother (see The Art of Craft). Today, rested and refreshed by Keizo’s care, we will go to Tokyo for the night and visit the Kokufu-ten bonsai show in Ueno Park. Then tomorrow we leave for Fukuoka to explore the island of Kyushu. The 11th annual Bay Island Bonsai “Exhibit of Fine Bonsai” is coming up on January 16-17 and Boon has again asked Mas to participate as a guest exhibitor. The BIB show consists of formal 6-foot seki-kazari displays, in which the main display object is paired with one or two other elements, such as a scroll or a small plant. 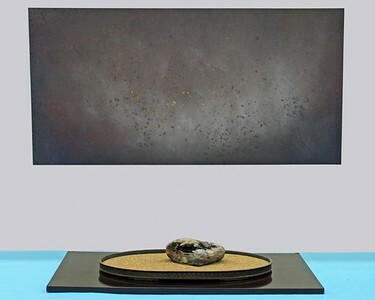 Mas has often chosen to make a contemporary display, pairing one of his own paintings with a suiseki, rather than using a more traditional Japanese scroll. It is always a challenge to select a painting that will harmonize with the suiseki and help to create a meditative space. This year Mas plans to show two stones that I have recently written about: Longevity and Pietà. Our club is excited about our new location at the Alameda County Fairgrounds and hope that everyone can find us there! Please go to the Bay Island Bonsai Exhibit page for details about the show. "Silence"; Klamath River stone (W 8 1/2" x D 6 1/2" x H 4 ") in copper suiban; Oil painting on wood - 48" x 24"
When Mas is out collecting, he will pick up a stone if he sees something of interest. If the stone material is good enough, with beautiful color or texture, he will bring it home for study even if he does not immediately see the potential suiseki. Mas collected this dramatic piece of jadeite simply because it is so beautiful. He hoped to perhaps find a good mountain shape in it. He left it in the yard for several months while studying it . During that time he noticed that in some views it looked like some sort of animal, maybe a cow or a sheep. Then one day he happened to put it in the right orientation, and discovered the image of a turtle. Mas cannot even find the words to describe his feeling – it was such a big surprise. For a Japanese (and other East Asian people) the turtle is a powerful symbol of good luck. The minogame (蓑亀), or 1000 year turtle, is a mythical animal that symbolizes longevity and brings good fortune. It is usually depicted with a long, feathery tail of seaweed, which is thought to grow in the turtle’s shell. His first daiza presented the stone very explicitly as a turtle. It had large legs and tail and he proudly showed it in 2001 at the 20th Anniversary exhibit of San Francisco Suiseki Kai. But his excitement quickly faded. By making such an obvious turtle, he hid the beauty and mystery of the stone. To me, it became “cute” instead of profound. A few years later he tried a this rather contemporary sculptural form, with simplified long legs and an open tunnel under the stone. He did it in plaster just to see if it would work, and he says it absolutely did not! You can judge for yourself in this picture. So Mas decided to go back to suiseki for this stone. He first tried the “contemporary style” of daiza that he has been using recently for some natural stones (see, for example, Hideko’s stone). This is a somewhat minimalist style, and Mas felt that it didn’t have enough “bite”. None of the bases he had made so far satisfied him. They did not harmonize with the aged, dignified, feeling of the stone and Kame-san was not happy. Finally he has gone all the way back to a traditional daiza. The simple elegance of the two-level rim, with its slightly decorative touch, supports and harmonizes well with the stone. While the finished piece does acknowledge the turtle shape (with the legs and fan-shaped tail), it does not over-emphasize it. The viewer can enjoy the suiseki, using her own free imagination. Mas says that it is amazing to find a stone such as this. He has been constantly trying to change the daiza and the way of displaying the stone, hoping each time for a bit of improvement. He says that the more he loves the stone, the more it gives him energy to continue meeting its endless challenge. As always, click on the photos for larger views, and a gallery of additional pictures. About eight or nine years ago, Mas started using spray paint on wood boards to create his suiseki art, and soon developed his technique to make paintings. 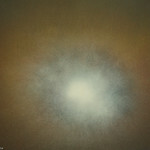 When I first met him, Mas was making paintings in his “Atmosphere” series. At the time, Mas told me that he was trying to “paint the sky behind the sky”. Light seems to pour from his paintings, and I swear they can brighten a dark room. Mas’ pictures are not representational landscapes, rather he tries to free his mind from any intention when he paints. But, like suiseki, the resulting images evoke the natural world and bring it into our human life. Some time ago I wrote about a suiseki that reminds me of a visit to Crater Lake with my mother (Evocation). Making the daiza for this stone had fired Mas’ imagination and, having once viewed Crater Lake from 30,000 feet, Mas wanted to go and see this magical place. We finally went this year as part of a road trip to the Pacific Northwest. The night before, even though we had been on the road for nearly two weeks, we were like little kids waiting for Christmas who are too excited to sleep. We got up about 4 am and left our motel just before dawn for the drive up Highway 138, along the North Umpqua River, to Crater Lake National Park. The river runs through a dense forest, and is a quiet, introspective place. There are no large vistas, instead you focus on the changing textures of the water surface and the play of light and shadow. We had only a beaver and the occasional fisherman to share our solitude. Arriving at Crater Lake, the dense forest gave way to sparse vegetation with widely spaced trees, and the grand view of the lake opened up. The crater (or more accurately caldera) was formed about 7700 years ago when the 12,000 foot high Mt. Mazama collapsed following a huge eruption. This eruption, the largest to have occurred on earth in the last 10,000 years, scattered ash 6 inches deep over 5000 sq. miles (15 cm over 12,950 sq km). The rim of the resulting crater stands at 7100 feet – meaning that 5000 feet of mountain disappeared in the eruption and collapse. The rim rises 1000 feet (305 m) above the surface of the lake which formed inside the crater. The lake is the deepest in the U.S. at about 1943 feet deep (592 meters) and the seventh deepest in the world. The lake has no inflows or outflows and maintains itself through rain and snow melt. The deep indigo color of the lake comes from the great depth of exceptionally clear, pure water. Following the cataclysm, the volcano continued smaller eruptions, building cinder cones within the crater. The largest of these is Wizard Island, which rises 2700 feet (820 meters) above the crater floor, and about 767 feet (234 meters) above the water surface. The last eruption was about 5000 years ago, but continued hydrothermal activity at the bottom of the lake shows that the volcano is not extinct. We spent the rest of the day on the Rim Drive, enjoying the colors and patterns on the water, the rock formations, and the whitebark pines that grow along the crater edge. At the end of the day, with the sun getting low, we started what we expected to be a relaxed, quiet drive along the Rogue River on Highway 62 to Medford. But suddenly, as we approached the town of Union Creek, we saw amazing rapids by the side of the road. 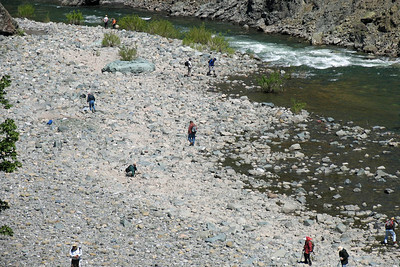 We quickly pulled off and found ourselves at the Rogue River Gorge. Here the river tumbles over waterfalls and through narrow chutes formed by hardened lava. Earlier in our trip we had crossed the sedate, mature river where it flows quietly into the Pacific Ocean. Now we were seeing it in its youth, dancing joyfully down the mountain. What memories I have whenever I look at my little suiseki.